PCTEL offers the GPSL1GL-TMG-40N timing reference antenna specifically designed for deployments in congested cell-site applications and able to receive signals from GPS, Galileo, and GLONASS satellites in the 1575.42 ± 10 MHz and 1602-1615 MHz frequency bands. The low-noise, high-gain amplifier is well suited to address attenuation issues associated with applications requiring longer cable runs. The proprietary quadrifiliar helix design, coupled with multistage filtering improves out-of-band rejection and lower elevation pattern performance. PCTEL offers the GPSL1GL-TMG-40N timing reference antenna specifically designed for deployments in congested cell-site applications and able to receive signals from GPS, Galileo, and GLONASS satellites in the 1575.42 ± 10 MHz and 1602-1615 MHz frequency bands. The low-noise, high-gain amplifier is well suited to address attenuation issues associated with applications requiring longer cable runs. The proprietary quadrifiliar helix design, coupled with multistage filtering improves out-of-band rejection and lower elevation pattern performance. 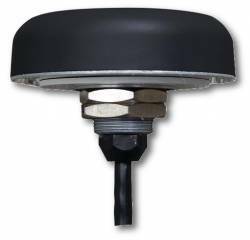 The GPSL1GL-TMG-40N weighs 0.75 lbs (0.34 kg), measures 7.25 inches in height x 3.2 inches in diameter (184 x 81 millimeters), and operates on power supplies ranging from 3.3-9.0 V. The antenna provides integrated lightning protection capability and features electrostatic discharge (ESD) and reverse polarity protection as well as transit voltage suppression.